One day you're scoffing at the nervous nellies desperate to ensure those lemon cupcakes are both gluten-free and organic, the next you're trolling the grass-fed recipe sites and cooking up quinoa wondering when exactly you yourself became so healthy food obsessed. It took a while, but I'm definitely looking at everything through my whole food lenses these days. Perhaps it's my quest to improve my own energy levels and reduce risk of future disease. Even more likely, the two smiling faces that look up to me (literally and figuratively) to prepare tasty meals have had a huge impact on my thinking of where our food comes from and how it is grown before it arrives at our table. Farm to fork, baby. Farm to fork. My new obsession? Quinoa. I'm not a pasta girl or a rice lover. I avoid wheat like it's the plague, but this ancient grain rings my bell. New to this superfood? I've rounded up a few transition products to ease you into the protein-rich goodness I've come to know and love. First, these Simply 7 chips. Let me apologize to you now for your new crunchy addiction. We can barely keep a bag around the house more than a day - and we are NOT snackers. They are that good. Made of quinoa and better than any chip I've had, these non-GMO goodies come in a range of flavors. They are also available in Hummus and Lentil varieties - but the quinoa are straight up amazing in my book. Ah-mazing. I grab mine at Whole Foods, but I've seen them popping up in quite a few shops. Seems I'm not the only fan! Next, these great Ancient Harvest rotelle noodles. A year ago I switched my daughter to brown rice noodles and never looked back. Now we've rolled over to these quinoa based oodles and she practically begs me to make my signature italian dishes with them. Major win. Another Whole Foods find that's worth searching for in the aisles. 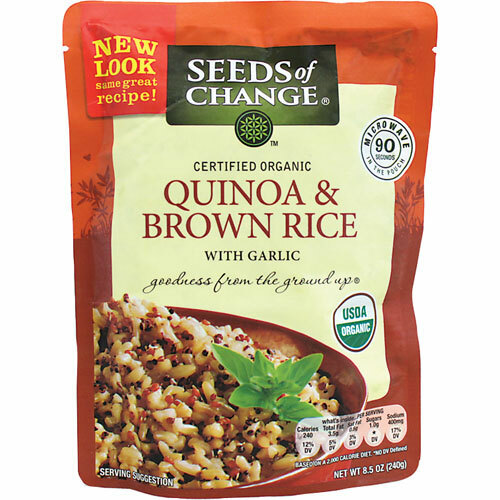 My new pantry secret weapon is this packet of goodness from Seeds of Change. It's a mix of brown rice & quinoa and it takes just moments to simmer in a pan and prepare. This incredible (and organic) combo has become the base for many a fabulous meal in our home. I LOVE this stuff and am always grabbing one or two more when I hit the market. It opened my eyes to the marvel of the delicious taste of quinoa. And... the whole family loves it. Another major win. Already a quinoa lover? You'll dig this tasty recipe from Alter Eco Foods. Packed with protein and a lively mix of fresh flavors, it's a terrific dish to introduce as spring and summer unroll themselves. Make it for brunch and watch eager eyes ask for the recipe. It's that tasty.